Love it or hate it, social media is here to stay. What’s more important for marketers is that social media is growing up. This means that you have to assess where your business is on the adoption curve as you develop your marketing plans. Be present. This is the first phase where your business is listening to the conversation and getting a feel for the different social media options. At this point, firms may leverage existing monitoring and analytics or take advantage of free tools to track company, brand and product mentions. It’s useful to have a crisis management plan in case of trouble. Test social media platform(s). During the second phase, you dip your toe into the social media waters with a small implementation. 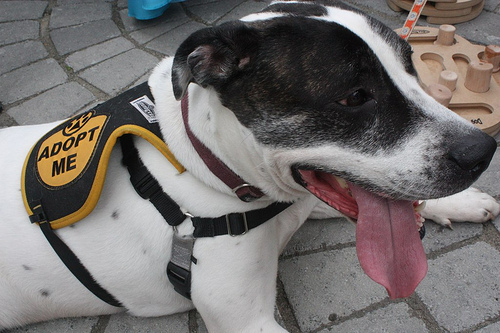 It’s often notable since it’s not part of any departmental plan or budget. It’s usually part of marketing and/or PR although it’s not uncommon for customer service to be involved. At a minimum, your firm should establish social media guidelines. It’s useful to create goals and related metrics at this point in order to be able to make the case for expanding your social media involvement later on. Expand social media presence. In the third phase, companies start to actively engage in the social media ecosystem. Often driven by budget and human resource needs, social media activity starts getting corporate recognition. At this point, firms hire a social media manager dedicated to social media interaction. With dedicated resources, it’s important to have a social media contingency plan rather than hope that there’ll always be someone to handle issues. Due to the increased investment, businesses begin formally tracking social media metrics. Integrate social media across departments. As social media strategy continues to touch more areas of the company, it becomes incorporated into a variety of areas, notably marketing, customer service, and sales. For larger businesses, this can translate to a more integrated approach to the customer and a larger focus on more sophisticated brand monitoring efforts. Develop social business. In the last phase, businesses become more engaged across the breadth of customer touch points. Senior management is vested in the success of social media efforts and creating social listening platforms. At this point, firms are tracking social media metrics and costs. More sophisticated businesses may use social CRM. Regardless of where your firm is on the social media adoption curve, understand that each step increases the breadth of your involvement. When this is done well, it can help your firm engage with customers and the public to determine their needs and make sure that their concerns are answered. In the process, your organization can become more effective while serving your market better. Is there anything else that you’d add to this list? If so, please add your thoughts to the comment section below. Do you agree or disagree with this social media adoption breakout? If so, why and what examples can you point to? 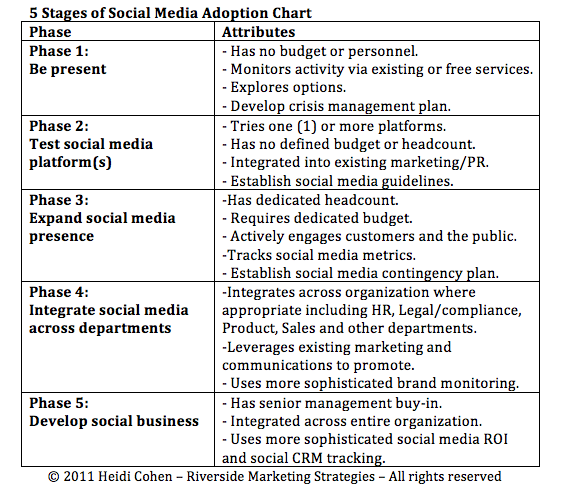 Where is your firm or clients on this social media adoption curve? What has your experience been and what do you recommend to others? What barriers to social media have you encountered? Do you have any advice for others? What other questions or suggestions do you have for others? Here are related articles of interest. How to guarantee your social media ROI is zero. Tags #smchat, brand monitoring, Chart, Social Media Contingency Plan, Social Media Guidelines. Bookmark the permalink. thanks for this really helpful post. 1. The chart is a great idea! But the attributes are’nt joint sets, which is not drama. Unfortunately they are not ordered by the same logic for each phase, too. I would recommend to adjust the attributes so they are joint sets / ordered equal. 4. We have discovered that “fun” and “joy” drive the adoption of social media. It’s opposites build strong barriers. My advice: Search for small bits and pieces, where business and fun are tied together. 5. We believe that social media is based on engagement. My question is: How do you create a strategy for engagement and integrate this into your business?